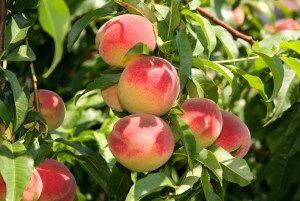 Weather conditions are an important factor when it comes to growing peaches in Florida. Due to the lack of cold weather, Florida peach crops often struggle without uniform flowering. However, researchers are working to solve this issue. Tripti Vashisth, an assistant professor and citrus Extension specialist at the University of Florida, says research is being done to find the best way to achieve uniform flowering in peaches. Uniform flowering can allow the peaches to have uniform fruit set, says Vashisth. “Once you have uniform flowering, then you can have uniform fruit set, and the management would be easier. And economically, it would be much better,” she says. Uniform flowering and fruit set is best for the growers in an economic sense, Vashisth says, since some fruit is removed to allow other peaches to become the preferred size fruit. One of the tools Vashisth’s research has found to work for flowering in peaches is a chemical called hydrogen cyanamide. She says research is still looking into how exactly this chemical helps peaches. “We are trying to optimize concentration at this point, but we have figured out that it is working fine for peaches in Florida,” Vashisth says.